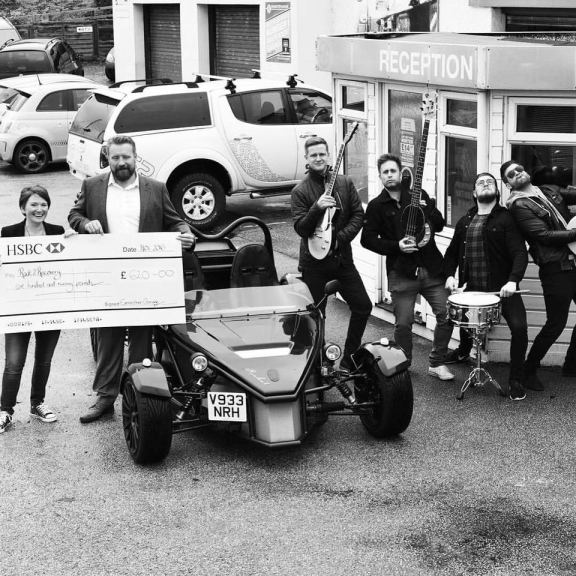 Exminster Garage teamed up with a local rock band to raise funds for charity Rock 2 Recovery after pledging to help those who serve their country in the British Armed Forces. The garage first became aware of the charity after signing up for the Armed Forces Corporate Covenant to support the armed forces community. Jo and husband Glen were very excited to receive a Silver Award in recognition of their pledge from the Lord Lieutenant of Devon at a ceremony held at Dartington. “But we wanted to make sure we were doing enough to deserve this recognition,” Jo said. Fate stepped in when Jo heard injured ex-serviceman Lee Spencer talk at Basepoint in Exeter. He mentioned Rock 2 Recovery and Jo contacted the Exmouth based charity, which helps Armed Forces veterans and their families deal with stress and brain injuries through music and friendship. It was set up by former Royal Marine Jamie Sanderson who has learned to cope with PTSD since returning from his final tour in Afghanistan in 2006. The fit with Exminster Garage’s aims seemed perfect, and was boosted further when the couple’s son, Sam, announced his band Leave before Dawn were about to release a cover of Demons by Imagine Dragons on social media. The song deals with being in dark places, a sensation sometimes experienced by veterans. “We had a lightbulb moment that this reflected perfectly the musical and creative methods used by Rock 2 Recovery and decided that Exminster Garage would pledge £1 for every share the new video received over a three-day period,” Jo explained. In the end, the total shares topped the 600 mark, and Jo, aided by members of the band, was delighted to present Rock 2 Recovery founder Jamie Sanderson with a cheque for £620. Jamie said: “It is fantastic that once Jo and the team at Exminster Garage became aware of us they were compelled to do something not only to support our fundraising requirements, but also to stand loyal to their declaration of support to the Armed Forces Corporate Covenant. Jamie added that the £620 raised by the garage and band will be used to help coach veterans out of crisis and refocus them in a new positive direction. The video can now be viewed on YouTube. Exminster Garage presenting the cheque. L-R Jo Strachan with Jamie Sanderson, band members Matt Watson, Scott Broomfield, Sam Strachan and Tom Watson.